I found this recipe while waiting in the waiting room for Maddison to have her teeth x-rayed and it has quickly become a favourite. The last time I made it was for a family whom we cook for on a community roster, and from all reports it was a winner! 1kg desiree potatoes (use whatever you have in the cupboard! ), peeled, chopped. This recipe feeds a family of 4, but for our family of 6 piggies I just use a kilo of chicken and double the ingredients! Combine dijon mustard, wholegrain mustard, honey and vinegar in a bowl. Cook potato in a saucepan of boiling water for 15 minutes or until tender. Drain. Return to pan. Add milk. Mash. Stir in corn and onion. Season with salt and pepper. Meanwhile, heat oil in a frying pan over medium-high heat. Cook chicken for 7 to 8 minutes each side or until cooked through, basting with half the mustard mixture for the last 2 minutes of cooking. Place beans, mash and chicken on plates. Top with remaining mustard mixture. Serve. 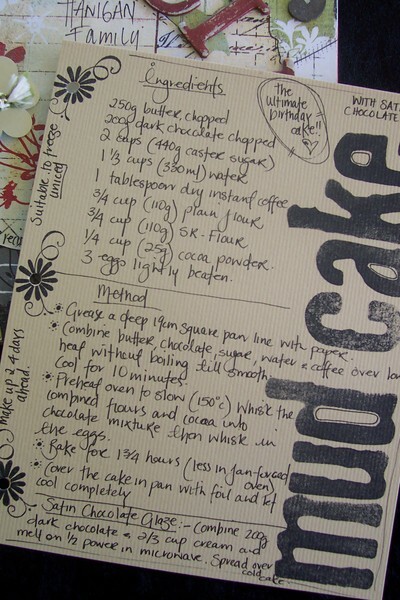 Recipe sourced from "tropical taste" magazine as presented in the 2010 Cairns post. Melt butter and add to dry ingredients and bake in a moderate oven for approximately 20 minutes. Ice with chocolate icing while still warm. Let cool in the tin before cutting up. This recipe can be successfully doubled, just cook a bit longer. 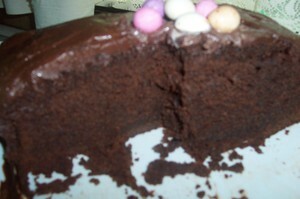 if you like it really chocolatey add a cupful of chocolate bits. Sift flour and salt together. Rub in butter. Add 3/4 of the cheese and enough milk to form soft dough. Knead gently. Cut scones and place on buttered tray. Top with remaining cheese, sprinkle with herbs and bake in a hot oven 220 degrees C for 15-20 minutes till cooked, serve hot. Yummy with real butter! When I make these i throw the flour and salt into the food processor and give it a whiz, then add the butter and give it a bit more of a whiz, add the cheese and enought of the milk to form a soft dough or till it forms a ball around the blade of the food processor, throw it out on a floured board, flatten with my hands and then cut them out. Ideally fresh herbs cut in quite chunky bits are just beautiful, but dried herbs work just as well. I will be getting photos developed tomorrow so this is another one I have to add to my recipe book. 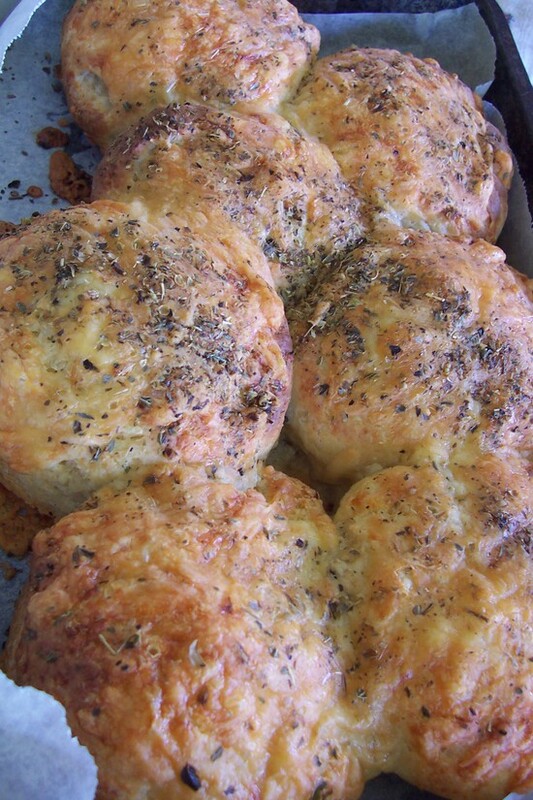 I have also made this recipe of late which is a favourite, from my good friend Yvette. Melt butter and cocoa, remove from heat and add sugar and eggs. Stir in flour, beat till smooth and pur into a greased tin 16cmx26cm. Beat cream cheese and extra sugar and vanilla, add extra egg and pour over chocolate mixture. Swirl through with a knife, so it gives a marbled effect and then cook in a moderate oven for approximately 40 minutes. Cut when cold. Freezes well. Another recipe for the banana choc-chip muffins that i posted on the blog yesterday. 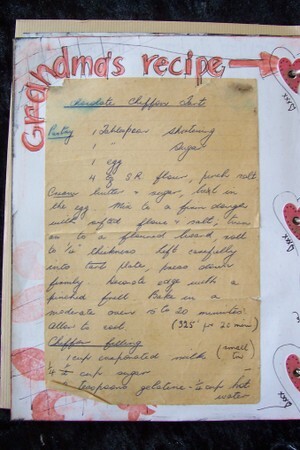 A very well loved recipe...... This is the basic recipe mix below - for choc-chip muffins add 125grams choc-chips, for apple and sultana muffins,delete the banana and add a heaped cup of pie apples and a good handful of sultanas, for date and banana add 1/2 cup chopped dates. Put all dry ingredients in large bowl, and stir together till combined. Put all wet ingredients in another bowl and combine. Add wet ingredients to dry and mix till just combined. Take care NOT to overmix or the muffins will become tough. (16 stirs!!) Spoon mixture into nonstick large muffin tins or tins that have been sprayed with cooking spray and bake in a 190 degree oven (lower if fanforced), for approx 25 - 30 minutes. Note: Rarely do i ever make a single batch this recipe works well when doubled. Page is to come, just have to get a photo printed of the muffins first!! A good old fashioned favourite is the pikelets, and we here love them with jam and lots of whipped cream, all the naughty stuff!! I have had a few photos printed of late of some of the recipes and intend to go back and include them in my recipe book, so shall share with you when i do. 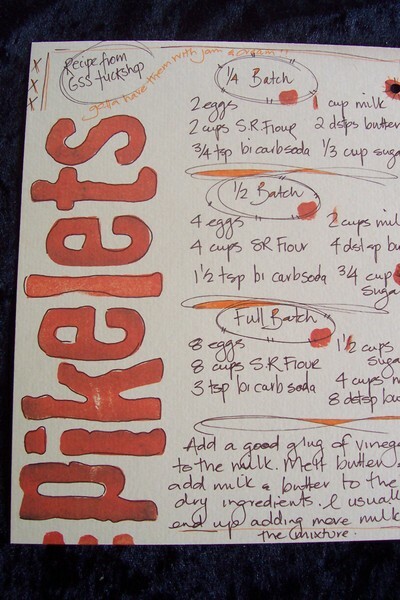 This pikelet recipe was given to me by a friend from a local school tuckshop so i have included 3 different size batch measurements. I have again used my big MM stamps with pumpkin stazon ink to decorate. 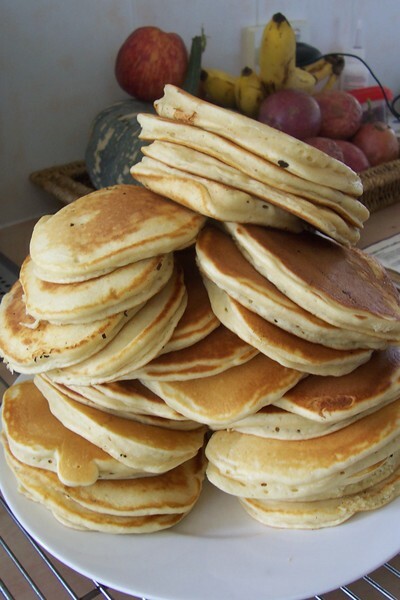 This is what they look like made up, I always end up with man size pikelets and usually make only a 1/4 size batch which makes heaps. ADD A GOOD GLUG OF VINEGAR TO THE MILK. MELT BUTTER AND ADD MILK AND BUTTER TO THE DRY INGREDIENTS. I USUALLY ALWAYS END UP ADDING MORE MILK TO THE MIXTURE. COOK ON A LIGHTLY GREASED PLATE ON ONE SIDE TILL BUBBLES APPEAR AND THEN FLIP TO THE OTHER SIDE. RECIPE IS GOOD TO FREEZE. while i know these recipes pretty well off by heart, i have to remember not to shorten the recipes too much, because when the day comes that this book is with one of the kids, they will need all the instructions - something to bare in mind. 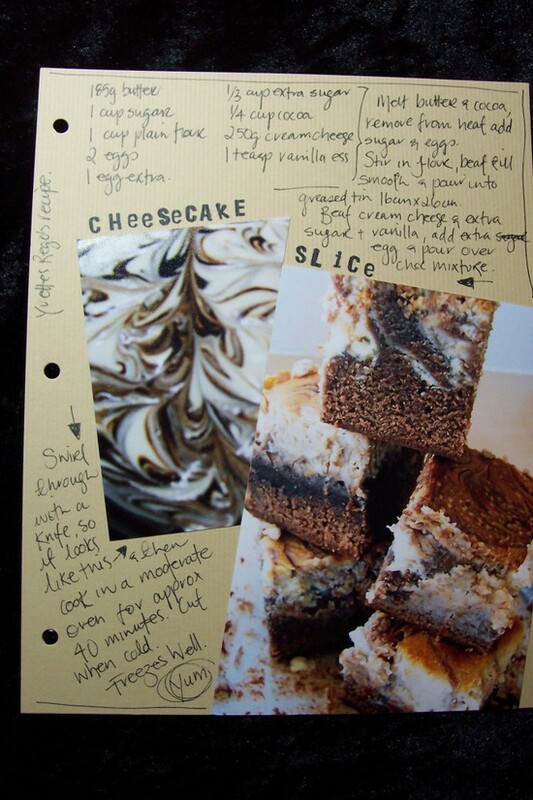 This cake can be made up to 4 days ahead. Store in an airtight container. Uniced cake is suitable to freeze. Combine the butter, chocolate, sugar, water an dcoffee in a medium saucepan, stir over a low heat, without boiling, until the butter is just melted and the mixture is smooth. Allow to cool for 10 - 15 minutes. Preheat oven to slow (150 degrees C). Whisk the combined sifted plain and self-raising flours and cocoa into the mixture in 2 batches, then whisk in the eggs. Pur mixture into the prepared pan. combine the chocolate and cream in a medium heatproof bowl and stir over barely simmering water until smooth or alternately carefully melt in your microwave on half power heat. Spread a thin layer of glaze all over the cold cake. Stand remaining glaze at room temperature until thickened slightly, then spread over top and sides of cold cake. 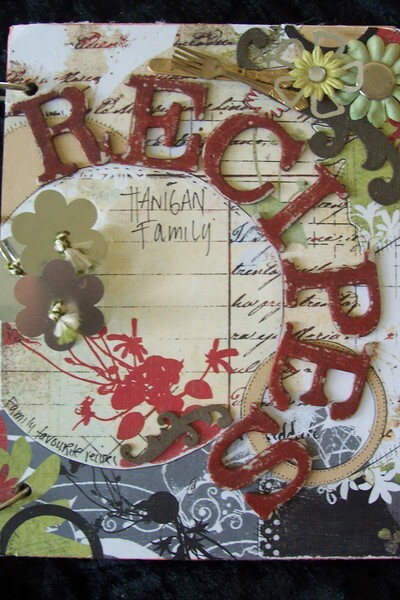 So I thought I would start this recipe blog on the side, it might entice me to keep updating my recipe book. I will only add tried and tested recipes into my book, you know the type you hand down and the type that have been handed down to me, but that I have made on more than at least 2 or 3 occassions and that I know i will make again. 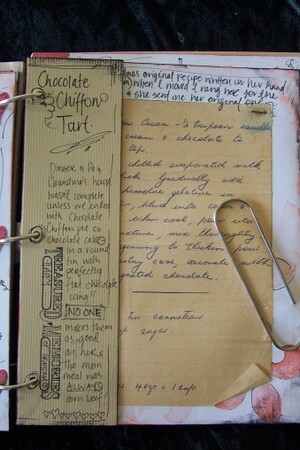 I have my Grandmas original Chocolate Chiffon tart recipe in there that she sent me one day when I phoned to ask for it. 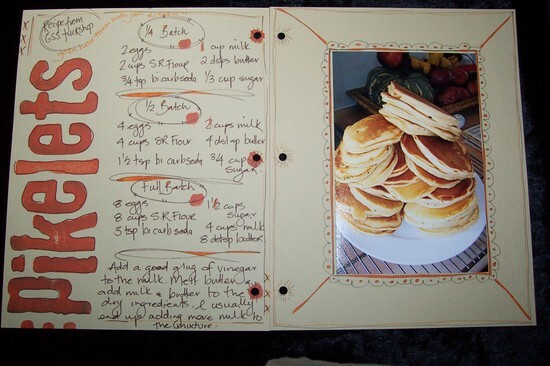 So I shall search for a photo here of the recipe book and shall start to share some recipes with you. I would love to hear your comments or any recipes you would like to share that I could try out on my family of 6! This is the front cover decorated with some basic grey paper and some painted and sanded chipboard letters. It is simply made from 2 pieces of thick chipboard glued together, one for the front and one for the back, covered in paper and then held together with 3 big clip rings down the side so that I can just keep adding pages. I doubled the chipboard to make it really sturdy and it can stand up open on the bench so you can read from it while you are cooking. I can't remember the exact sizes but I can check it out if anyone wants to know just leave a comment and I can email the details. I have made the inside pages slightly smaller than the front and back cover and have used journalling block stamps for a bit of interest. As well as recipes I have included little snippets along the way - which family members favourite, who the recipe came from, whether i successfully double, triple, or quadruple the recipe (rarely do I ever cook in single batches! ), I have recipes the kids have bought home from school, recipes they have found or been given and come home and cooked themselves and they therefore automatically become theirs as is the one to the right "Maddisons Valentines day Cookies"
I will post a few more photos and then I will make an album with them in the sidebar, so that every time I share a recipe I shall (fingers crossed) add it to my recipe book - or that is the so-called plan anyway!! 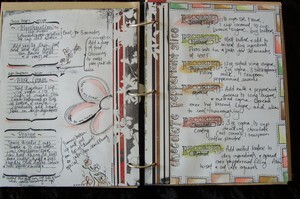 I guess I have generally played around with pens and watercolour pencils and stamps on these pages. I have reinforced the edge of each page where the rings go with strips of paper on each side or punched out circles or shapes where the rings go through. I really stressed to the ladies when we did the class that as well as being a creation that they had made with care that I really wanted it to be something that was functional and they would use, not just something to sit on a shelf and gather dust! 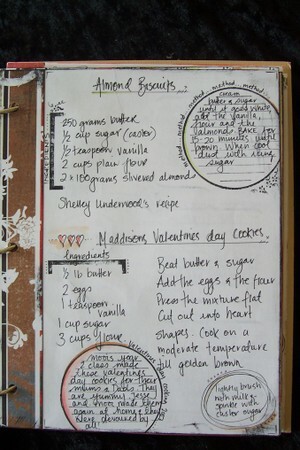 After all what is a recipe book without smudges of ingredients on the pages! I have also simply ripped pages out of old books and punched holes and added them "as is" without actually writing them out again - so really whatever takes ones fancy. So now that I have waffled on about the reason behind starting this I shall bid you goodnight and tomorrow shall share my first recipe with you! !